Until 1812 Delamere existed only as the forest (‘the forest of the meres’), and Oakmere only as one of the lakes in the forest. The land was owned by the Crown (originally for use as a royal hunting ground). Through the 1812 ‘Act of Enclosure for Delamere Forest’ half the land was sold for agricultural use and the parish of Delamere was created, comprising the four ‘townships’ of Delamere, Oakmere, Eddisbury and Kingswood. The rest remained a Crown forest, and was set aside for the production of timber. In 1866 Oakmere and Kingswood became separate civil parishes, and Kingswood was subsequently divided between the neighbouring parishes of Manley and Norley. In 2015 Delamere and Oakmere were re-united as two wards in a new civil parish. The ecclesiastical parish of St Peter’s, Delamere still covers most of the area of the original civil parish of 1812. History scrapbook Extracts from Delamere and Oakmere News (from Issue 1 to Issue 39). ‘Delamere: the History of a Cheshire Parish’ Local History Group (1991), edited by Frank Latham (with illustrations by Don Wilson). The book covers the whole of the original parish of Delamere and the current civil parish of Delamere and Oakmere. ‘The Story of Kelsall’ Elspeth Thomas (with illustrations by Anne Saul). Published by Kelsall and District Rural Amenities Society. A large part of this excellent book covers the history of the forest, including Delamere and Oakmere as well as Kelsall. The Delamere Meridian The Sandstone Ridge Trust has prepared this booklet describing the history of the trig point on Pale Heights, which played a central role in the production of the first Ordnance Survey maps in the 1820s. The Trust’s website also includes other information on the history and archaeology of the parish. ‘A Landscape Interpretation of Delamere Forest‘ Dr. Joan M. Fairhurst. An authoritative account of the evolution of the landscape and habitats of the parish. Version 1: from ‘Diaries of a Lady of Quality’ by A Haywood (ed. 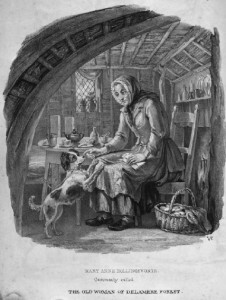 ): part 1, part 2Version 2: from Google Books, ‘The Story of the Old Woman of Delamere Forest’ by Frances Williams Wynn (can also be accessed HERE) The Story of Maria Hollingsworth, who came to live in the forest in 1815. ‘The Forest of Delamere’, 1903 Chapter 7 of ‘Picturesque Cheshire’ by T.A.Coward, Sherratt and Hughes, London, 1903.